My radio experience (if you can call it that!) 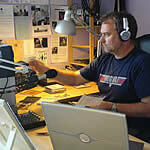 began in January 2005 when I started broadcasting on Live365. The initial couple of shows were done entirely on my laptop, with the vocal links being recorded separately and mixed with MP3 versions of the music. I did this mixing "as live", starting again if I really buggered things up, but it felt like a cheat somehow. Over time I managed to get various bits of kit together, such as second-hand mixers, CD players, MiniDisc recorders, etc. and have for a long time now been recording my shows live and recording them as I go, gradually creating my own radio studio at home. Like many of those good people you can also read about on this website, I was involved in the very early days in discussions of the setting up of an internet radio station inspired by John Peel. This station became Dandelion Radio. I had been a Peel listener since around 1977. I was attending Quarry Bank school in Liverpool (following in the footsteps of John Lennon) around the time punk was exploding all over the UK. Many of the kids started getting their hands on these unbelievably groundbreaking records and going to each others' houses to play them to one another after school. One of our (younger!) music teachers even allowed us to bring our records in to play them during the last 15 minutes of the music lesson! There was a shop not too far from the school where you could get your hands on some records, but because they were mostly beyond the means of my pocket money I usually begged the shop to play records on their turntable when I'd pop in for an hour or so after school. There was simply no other way to readily hear punk records. Then a rumour went around school of a strange bloke on BBC Radio 1 who used to play the stuff. What? On the BBC?! Sure enough, it wasn't long before I found the voice of John Peel and unknowingly joined the ranks of those who listened to the programme in bed via a small piece of yellowing plastic sticking in one ear. From that bed, and through that tiny earpiece, my music world started to open up. For years I'd wanted to be involved in radio and to DJ my own programme. Several years ago I was offered the chance to have a weekend show on a hospital radio station, but turned it down because I couldn't bare the thought of potentially playing records I didn't like. (What an idiot! It would have been experience of live radio!) However, despite this desire, and the corresponding lack of knowledge of opportunities, what was the point anyway, I thought, if John Peel was there doing it? There was no point. And he'd be there forever, right? His death on 26 October 2004 was, of course, unexpected and untimely on many levels, and I write this as we approach the second anniversary of that tragic day. It was a terrible time for all Peel listeners (which makes me wonder, even today, how his family and friends coped, and continue to cope), and it was an interesting time for me as that was also my Wedding Day! However, after a couple of short and dark months I decided that I would do what I can to create a radio show and to do my own tiny bit to fill the void he'd left unintentionally. I was interviewed for a documentary the BBC made for the very first John Peel Day in 2005 (along with our very own Andrew Morrison and Phil Edwards) in which I said (amongst other rubbish) that to fill this void even partially is going to take all of us. At Dandelion Radio, we're doing our tiny bit to involve all of us. Everyone currently involved in Dandelion Radio has his or her own John Peel story to tell; of finding him, of a life listening to him, and of the loss felt when he left us. You probably also have your own story to tell (and if you do, why not leave a message in our station Guestbook). However, Dandelion Radio is about looking forward, but without losing sight of what came before. So I hope you willenjoy looking to the future of music with us, whilst always appreciating what brought us here.